Rendang is a spicy meat dish commonly served throughout Malaysia, traditionally prepared for special guests and ceremonies. The flavours develop over the long slow braising time, giving a wonderful mellowness but still packing plenty of taste. Try using chicken or pork belly instead of beef. 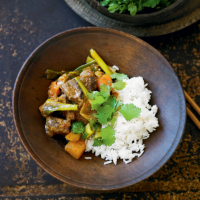 Plain rice works just as well with a rendang. 1. Preheat the oven to 180°C, gas mark 4. Heat the oil, and fry the steak and onion for 3-4 minutes until browned. Add the rendang and lemongrass pastes, and cook for a further minute. 2. Stir in 1 can coconut milk, 50ml water, the cinnamon, and the butternut and sweet potato mix. Bring to the boil and transfer to a casserole dish. Cover and bake for 1½ hours. Then stir in the salad onions, and cook for a further 10 minutes, uncovered. 3. Meanwhile, place the rice in a medium saucepan and add the remaining can of coconut milk. Then fill the can with water and add to the pan as well. Bring to the boil, cover and simmer very gently for 10-12 minutes, stirring occasionally until tender and all the liquid has been absorbed. 4. Serve the rice with the rendang and sprinkle with coriander.